Mitochondria are commonly called as power house of the cell. They provide energy transuding system. This system is used to change the food into chemical energy by oxidative phosphorylation ATP is synthesized during oxidative phosphorylation. Mitochondria are rod shaped. Their diameter is about 0.5pm. They have variable length up to 7pm. There are 1000 to 1600 mitochondria in liver cells. The mitochondria contain two membranes. These membranes are separate by 8 to 9nm. The membranes are composed of unit membrane structures. The unit membrane is composed of lipid and protein molecules. These membranes form two ompartments. 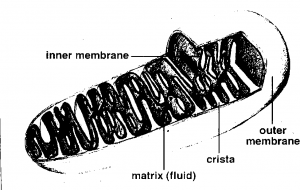 I ner compartment: It is filled with the mitochondrial matrix. It is bound by i ner membrane. I uter compartment: It is °resent between the inner and outer membrane. The itochondrial matrix is generally homogenous fluid. But sometimes it conta ns dense granules. These granules contain phospholipids. The mitoc ondrial matrix also contains a circular DNA and ribosomes. The i ner membrane of the mitochondria contains numerous small particles. Thes are called elementary or F1 particles. Their diameter is 8.5nm. They are regul rly spaced at intervals of 10nm on the inner surface of the inner mem•rane. These particles contain special ATPase complex and proton pump. This c•mplex is involved in the coupling oxidation and phosphorylation. 0 er Membrane: Monoamine oxidase, NADH-Cytochrome reductase, Fatty aci CoA ligase. Sp:ce between outer and inner membrane: Adenylate kinase, nucleoside dip osphokinase. Matrix: Malate dehydrgenase, Citrate synthetase, a-keto acid dehydrgenase. Mitochondria! matrix: Krebs’s cycle and a-oxidation and 13- oxidations of fats. Inner membrane: Electron transport chain and ATP synthesis by oxidative phosphorylation.